Plans to transform one of Edinburgh’s most important landmark buildings into a global visitor experience for Scotch whisky brand Johnnie Walker have been formally submitted to the City of Edinburgh Council. 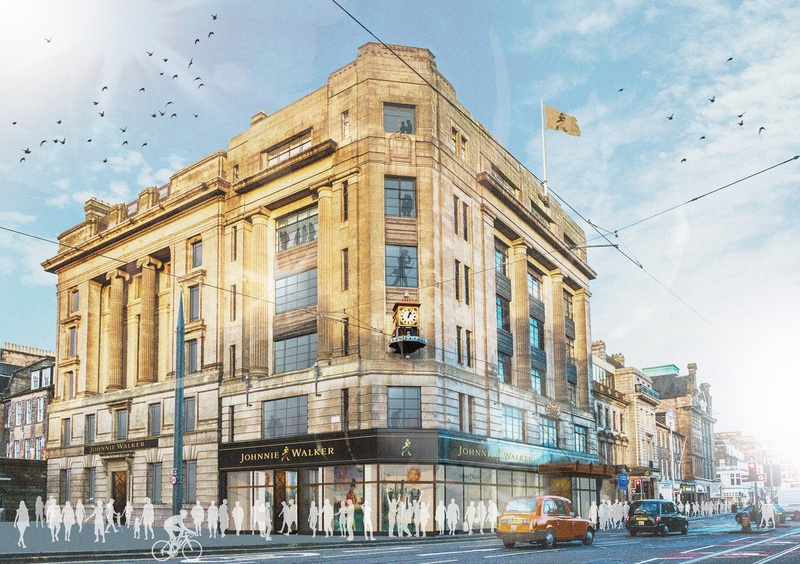 The planning application, jointly submitted by Diageo and the building owner Parabola, sets out proposals for a seven floor visitor experience at the former House of Fraser building at 146 Princes Street. The Edinburgh attraction is intended to be the focal point of a £150 million investment in Scotch whisky tourism by Diageo. The proposals would see the meticulous restoration of the building with its many beautiful heritage features preserved where possible and integrated into the new development. This will include restoring the famous clock on the corner of Princes Street and Hope Street –known locally as the Binns corner after the former department store - which was an Edinburgh institution and traditional meeting point for city residents. Economic projections for the plans indicate that when fully operational it will create between 160 and 180 new full-time equivalent jobs and generate in the region of £135m in tourism spend in the wider Edinburgh economy through the visitors it attracts to the city. The development also creates a powerful strategic opportunity for Edinburgh city centre, establishing a major attraction in the west end, helping to balance visitor footfall across the city. Tony Hordon, managing director of Parabola, added: “At Parabola we feel like the custodians of a beautiful piece of Edinburgh real estate and we have taken great care to consider its future. 146 Princes Street represents an opportunity to deliver our core values: place, quality and destination. Diageo is currently investing over £185m in Scotch whisky experiences in Scotland. As well as the Edinburgh location, the company is also investing to transform its existing 12 distillery visitor attractions across Scotland and a £35m investment to reopen the iconic distilleries of Port Ellenand Brora.